Some days don’t go as planned. I’ve had quite a few of those days recently as our moving date gets closer. It feels like we’re continually taking two steps forward and one step back — which, I acknowledge, is better than one step forward and two steps back. Progress is being made; slow progress, but progress all the same. I think I may have mentioned before that socks are possibly my favorite knitting project, and I come back to them often. Somehow just the act of casting on a pair of socks calms my nerves. Contrarily, I’ve been under so much stress in recent months that I haven’t had the concentration to work on socks. A couple of weeks ago, I decided it was time to take charge and stop that nonsense. I pulled a skein of Plymouth Yarn Stiletto from my stash. 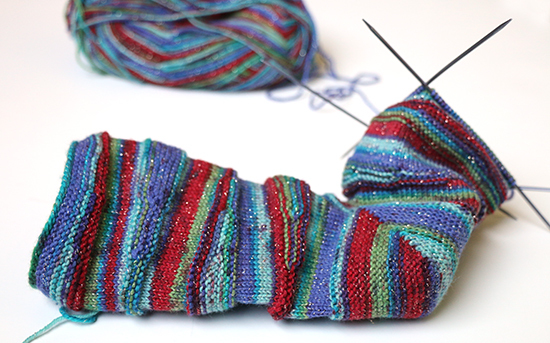 The colorway is 700, which is a bright self-striping combination of reds, greens, and blues with a hint of gold sparkle running throughout. After knitting a swatch to check my gauge, I decided on the pattern Wedge by Cookie A. I thought the wider stripes would play well with the wedge shapes. The pattern is fairly straightforward. As noted in many of the comments on Ravelry, I had to shift the beginning of the round before starting the toe. Another comment I saw is that this pattern uses a lot of yarn, and I have to agree. I knit Version 2, which has a shorter leg, in size Large. The pattern calls for 360 yards regardless of version or size. 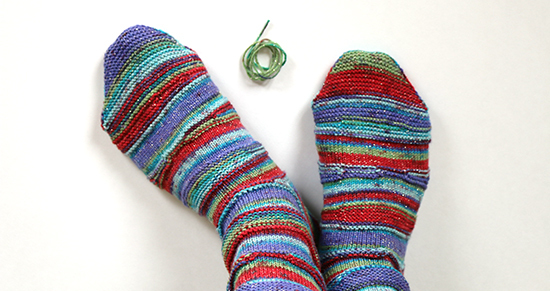 A skein of Stiletto has approximately 384 yards; I matched the pattern’s gauge and finished the socks with a mere 18 inches of leftover yarn. It doesn’t seem like an excessive deviation from the pattern but it’s enough that if I had knit Version 1 and/or size Extra Large, I would have run out of yarn. Yes, that little bit of green is all that was left of the skein. 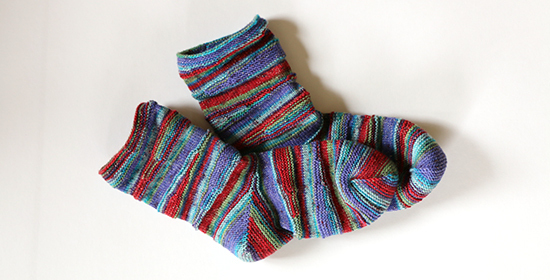 While the multiples of nine made the short row pattern easier to remember, I think that if I were to make these socks again I would stagger the short rows a bit for smoother transitions. Wedge would be a fun sock to make in an off-white yarn for mummy feet on Halloween. I was on track to finish the socks yesterday and have my blog post ready to go this morning when I encountered a step back. Without going into too much detail, I spent far too many hours yesterday cleaning up after animals that aren't ours and painting over damage caused by children who aren't ours. My husband tried to convince me that the painting would be a suitable story for this blog, but I declined. I suppose the silver lining — or should I say gold sparkle — of the timing for that step back is that I was able to soothe my nerves afterward by knitting the final rows of the second sock. Oh they are gorgeous - I love the sparkle running through it! Thanks! The sparkle is what initially drew me to the yarn. I was worried that it would be scratchy, but it isn't.